The Holographic Basketball Award has an insert that appears to move as the award is turned. This basketball trophy is economically priced to fit any budget. All custom built basketball trophies come with a laser engraved brushed gold plate. You will find a large selection of basketball awards here. FREE Shipping is available on orders over $100. FREE Engraving. The Holographic Basketball Trophy has an insert that appears to move as the award is turned. This Basketball Award is economically priced to fit any budget. All custom built basketball trophies come with a laser engraved brushed gold plate. You will find a large selection of basketball awards here. FREE Shipping is available on orders over $100. FREE Engraving. The Holographic Classic Basketball Trophy has an insert that appears to move as the award is turned. This basketball award has an beautiful round Column to increase the trophy's impact. This Basketball Award is economically priced to fit any budget. The trophy comes with a laser engraved brushed gold plate. FREE Shipping is available on orders over $100. FREE Engraving. The Laurel Basketball Trophy is available with several different inserts. This beautiful basketball award is a great value. All custom built basketball trophies come with a laser engraved brushed gold plate. You will find a wide selection of basketball awards here. FREE Shipping is available on orders over $100. FREE Engraving. The Laurel Classic Basketball Trophy is available with several different inserts. This beautiful basketball award is a great value. All custom built basketball trophies come with a laser engraved brushed gold plate. You will find a wide selection of basketball awards here. FREE Shipping is available on orders over $100. FREE Engraving. The Mega Star Basketball Award is a great choice for your star players. This Basketball Trophy is economically priced to fit any budget. All custom built basketball trophies come with a laser engraved brushed gold plate. You will find a wide selection of basketball awards here. FREE Shipping is available on orders over $100. FREE Engraving. The Pennant Basketball Trophy is one of our most popular awards. This Basketball Award has an insert indicating the year or place won. All custom built basketball trophies come with a laser engraved brushed gold plate. You will find a large selection of basketball awards here. FREE Shipping is available on orders over $100. FREE Engraving. The Pennant Classic Basketball Trophy is one of our most popular awards. This Basketball Award has an insert indicating the year or place won. All custom built basketball trophies come with a laser engraved brushed gold plate. You will find a large selection of basketball awards here. FREE Shipping is available on orders over $100. FREE Engraving. The Spinner Basketball Award has a ball that spins like a globe. 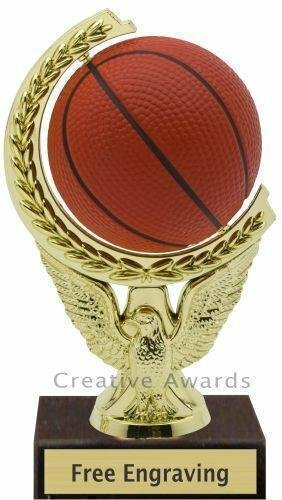 This basketball trophy is a small inexpensive basketball award with great character. All custom built trophies come with a laser engraved brushed gold plate. FREE Shipping is available on orders over $100. FREE Engraving. The Spinner Basketball Trophy has a ball that spins like a globe. 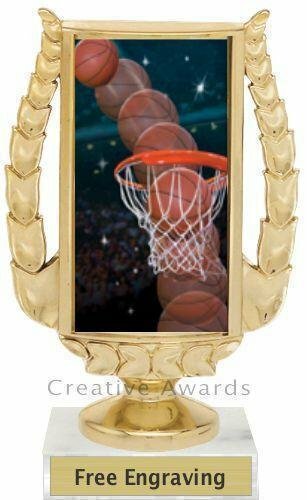 The round Column provides additional height to this inexpensive basketball award. All custom built trophies comes with a laser engraved brushed gold plate. You will find a large selection of basketball awards here. FREE Shipping is available on orders over $100. FREE Engraving.